Since April 29, the museum is no longer accessible to the public. The collections labeled Museum of France, in accordance with the decision taken in extraordinary general meeting, will be transferred in the coming months to the Museum of Art and Industry of the city of Saint-Etienne. By the end of 2018, a prefiguration space presenting the major pieces of the collections will be installed at the Museum of Art and Industry. Our museum dedicated to the history of the city of Saint-Etienne is located in a beautiful town house from the seventeenth century. It was built between the yard and the garden. We chose a chronological presentation starting in the medieval period of the town and ending at the great Industrial Revolution period in the nineteenth century. This presentation allows the visitor to understand the atypical development of the first French industrial city. The city memories are told through paintings, pictures, a model of Saint-Etienne in 1445, a city map and also one of the oldest train ticket in the world. Our museum is managed by volunteers of the « Histoire et patrimoine » association with the financial and scientific support of the City Hall. The house was built in 1658 for Claude Jullien-Chomat and his wife Madeleine de Thomas de Forcieu de Rochetaillée. 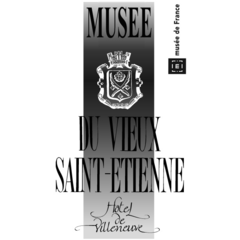 Now the building belongs to the city of Saint-Etienne and hostes our museum since 1932. The building is protected by a French label as an « historical building » (Monument Historique) since 1967. One of its particularity is the wooden coffered ceilings on the first floor named « plafonds à caissons à fougères » (fougère meaning fern). The way they are made is typical from Saint-Etienne and the Forez area. Augustin Dupré engraver at the "Monnaie de Paris"
nice tour but the audio (text to speech) is unbearable to listen to.